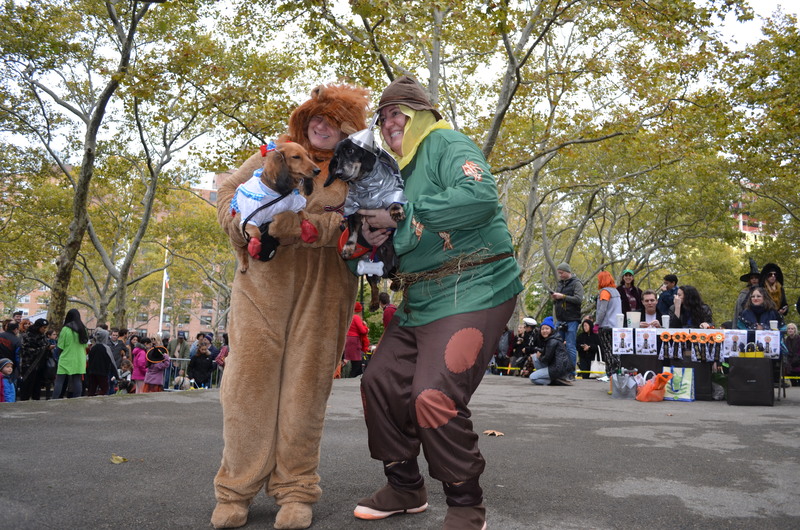 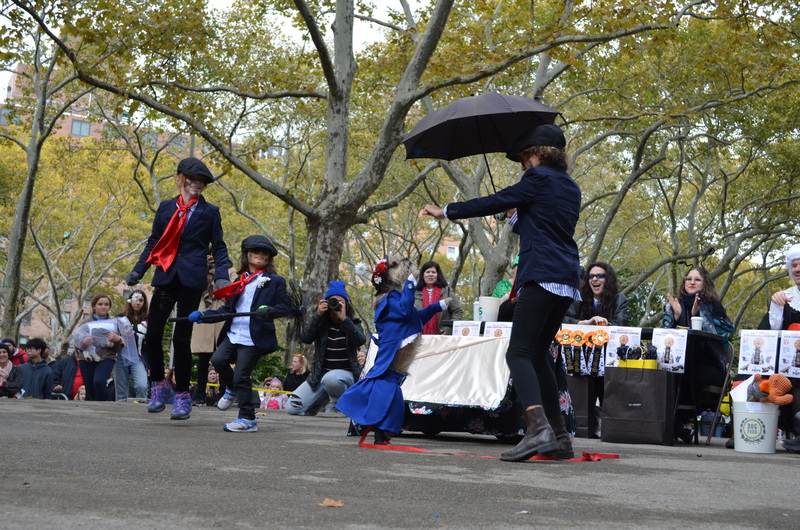 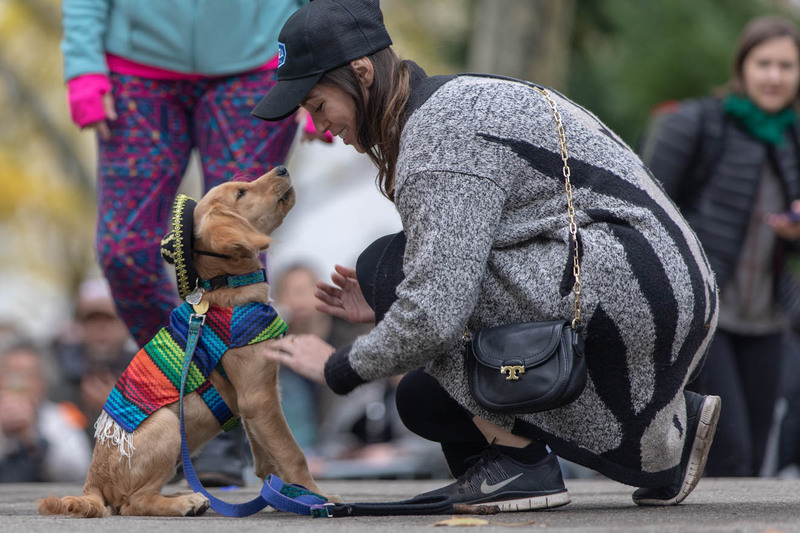 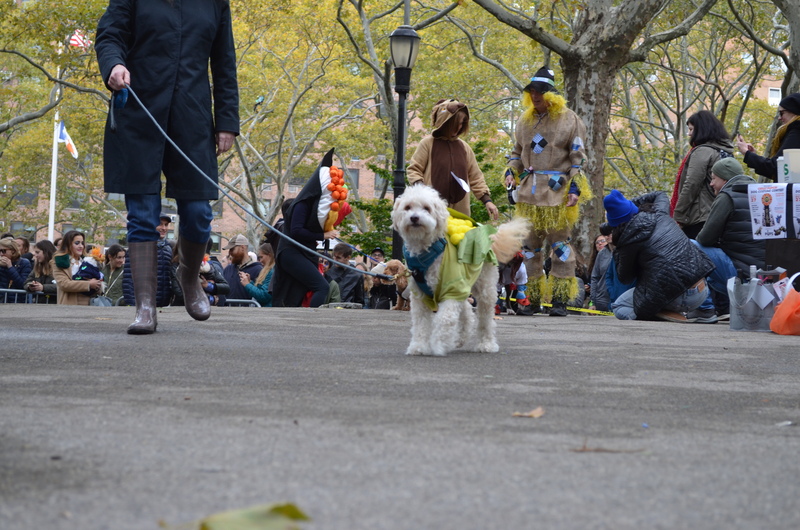 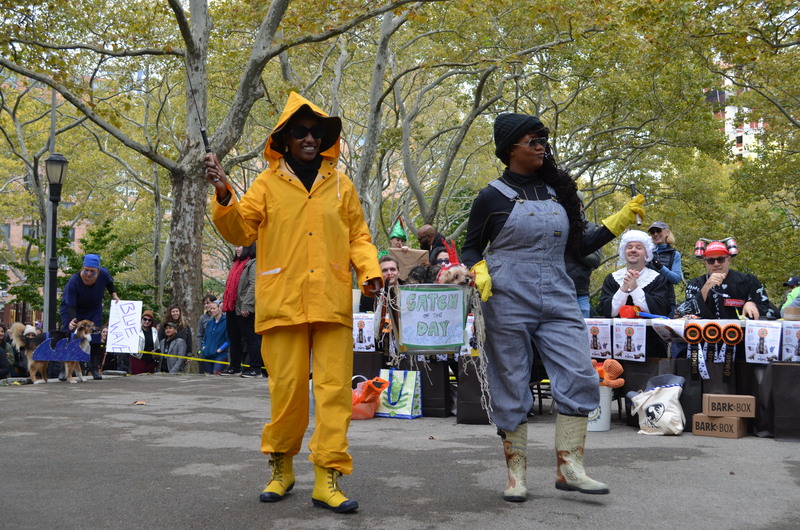 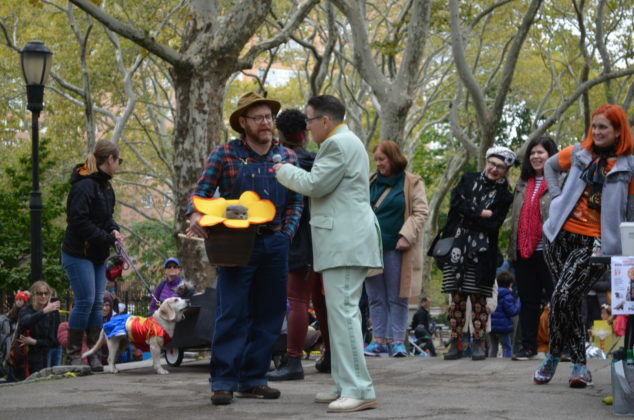 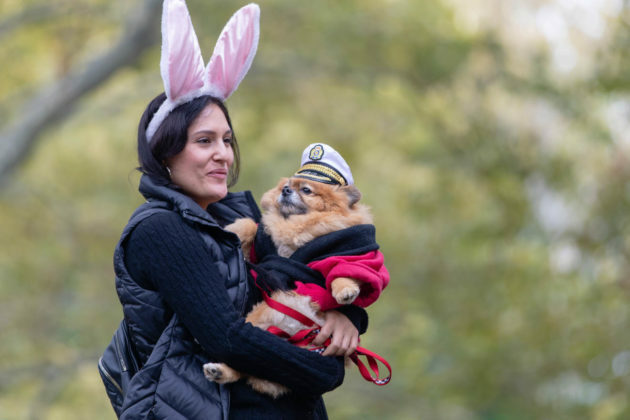 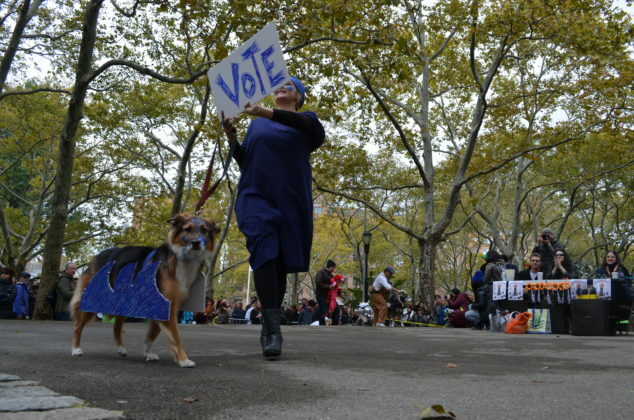 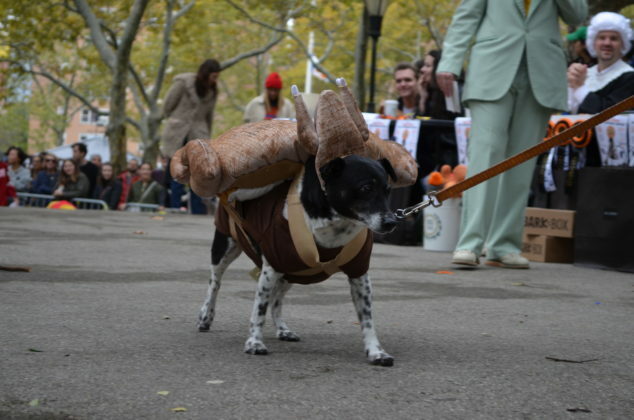 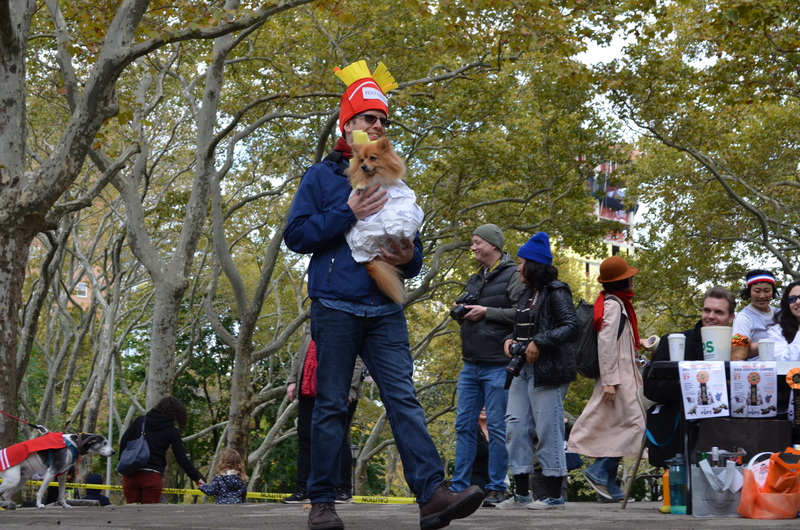 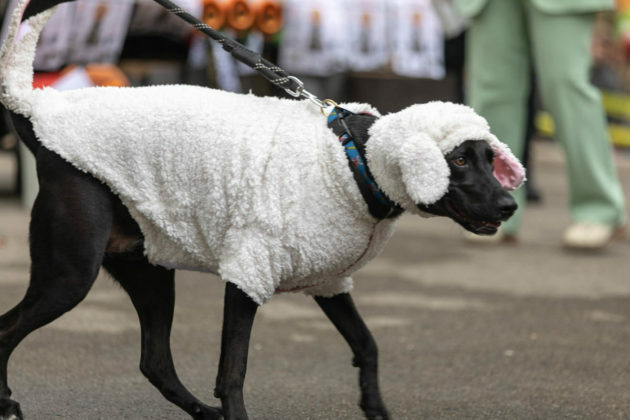 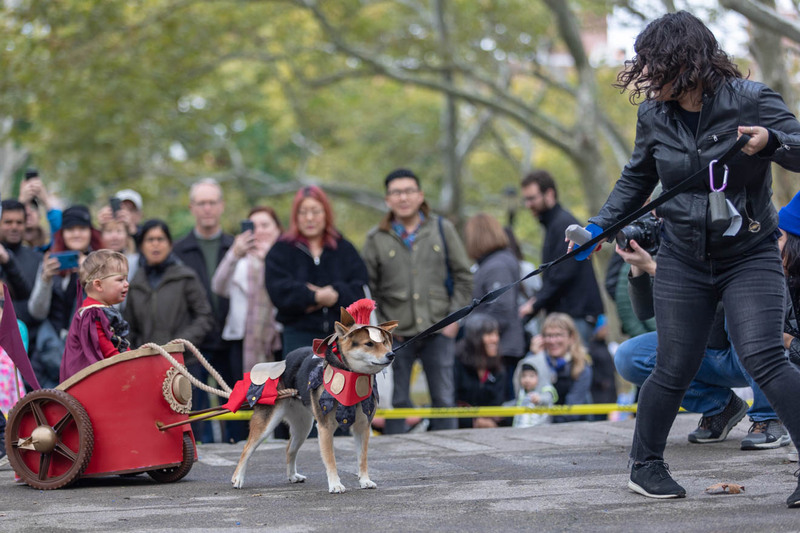 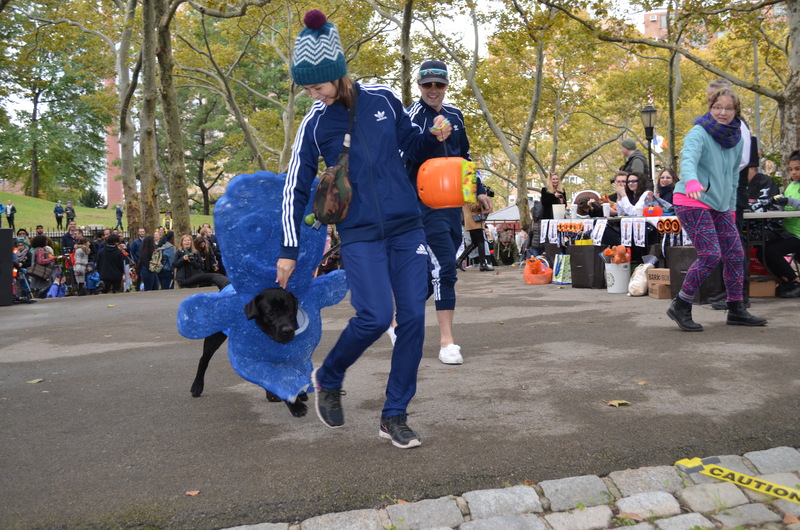 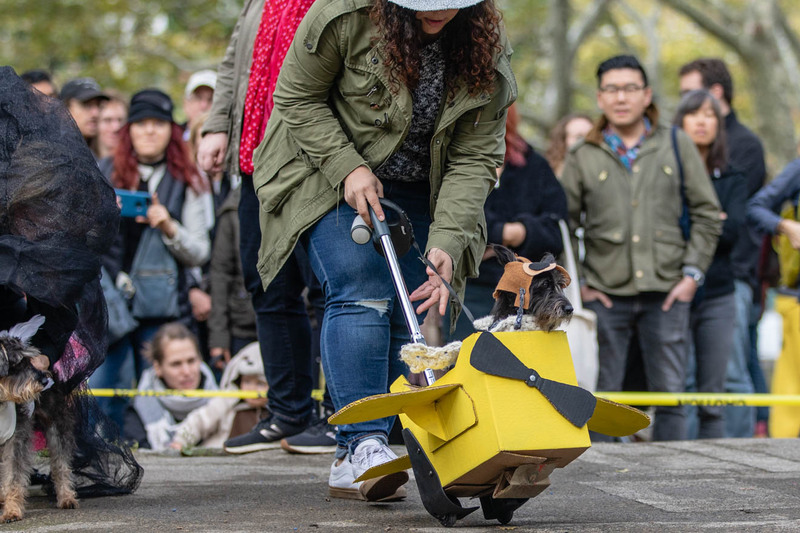 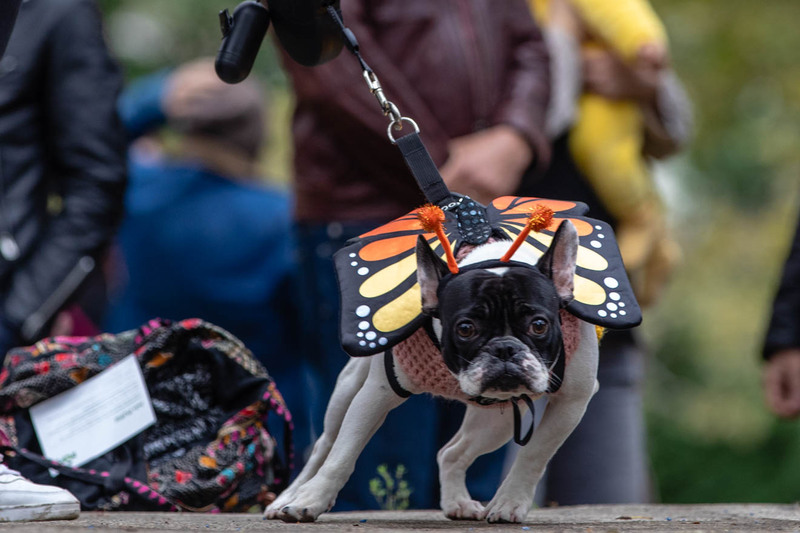 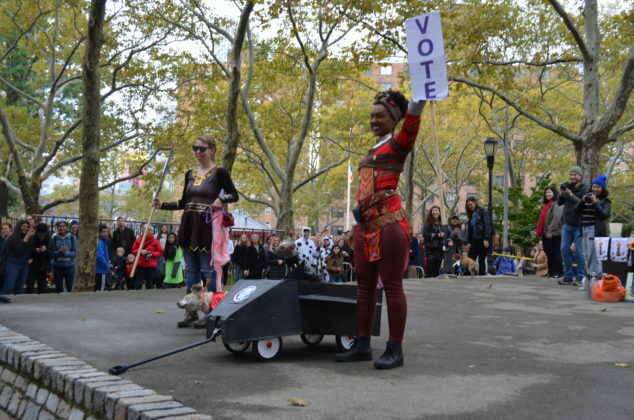 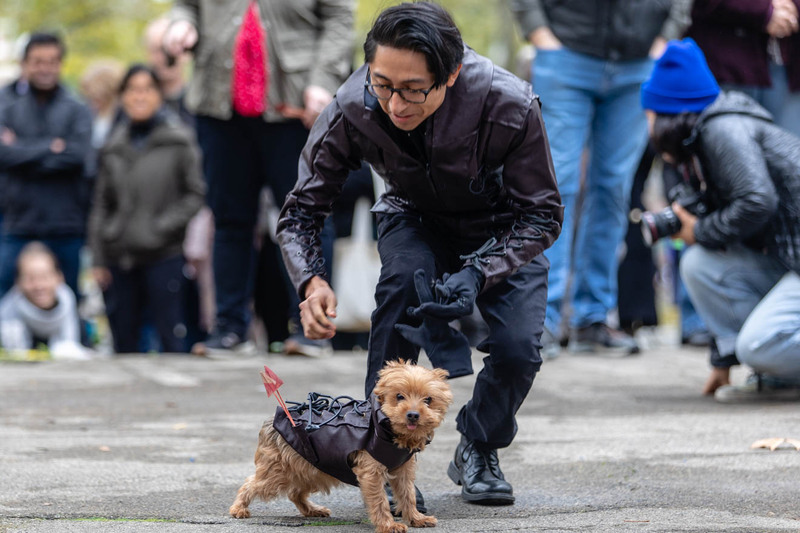 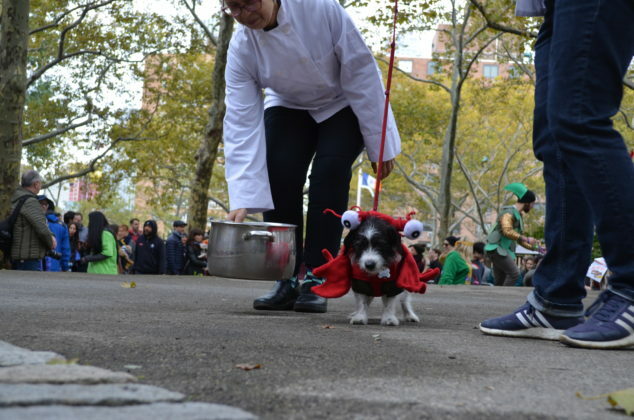 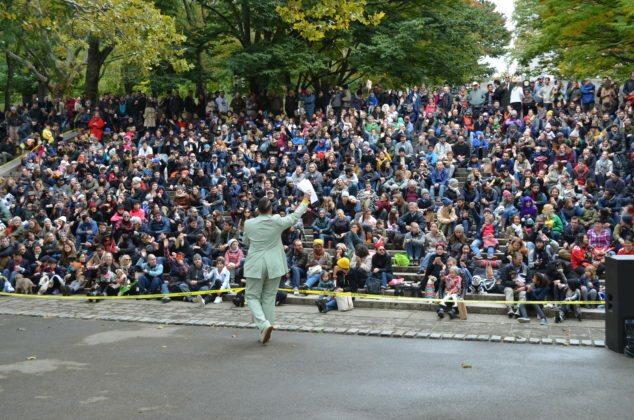 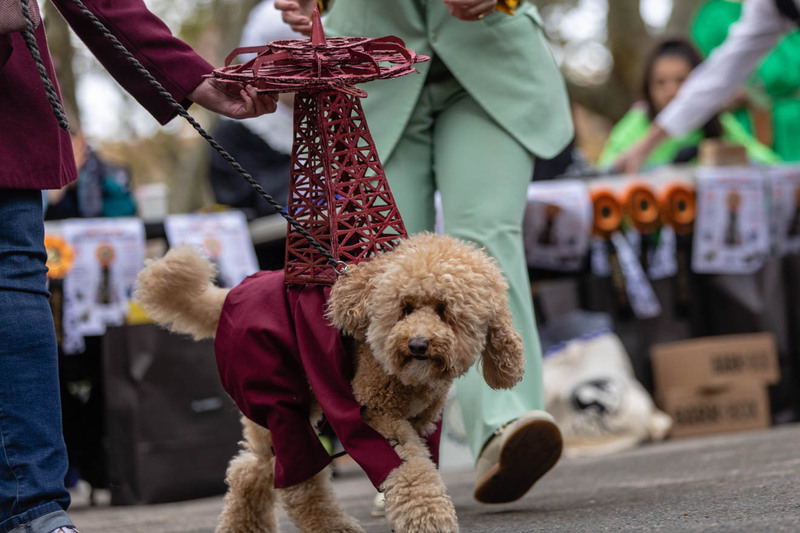 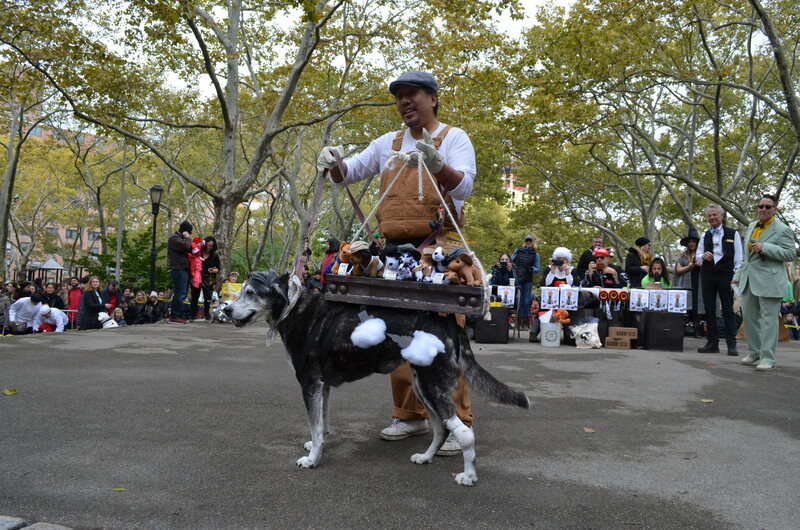 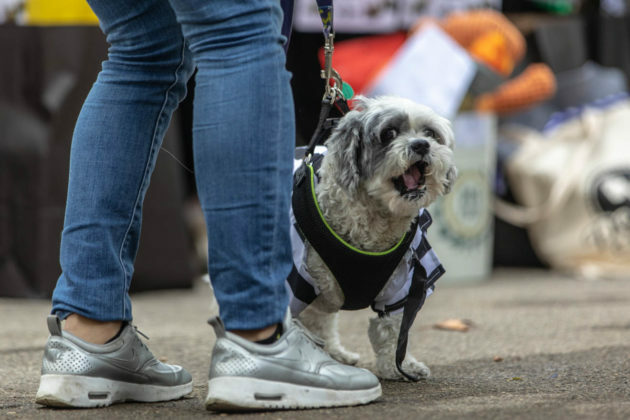 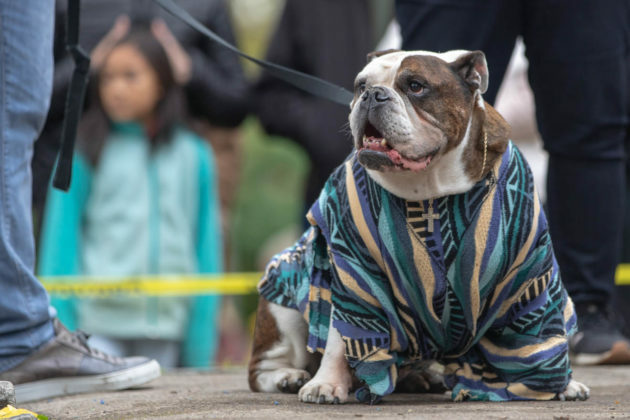 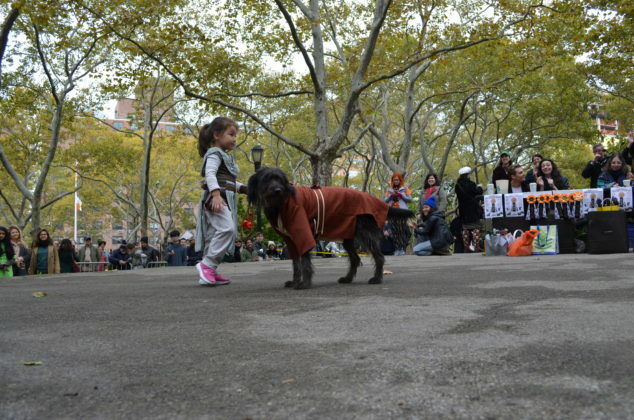 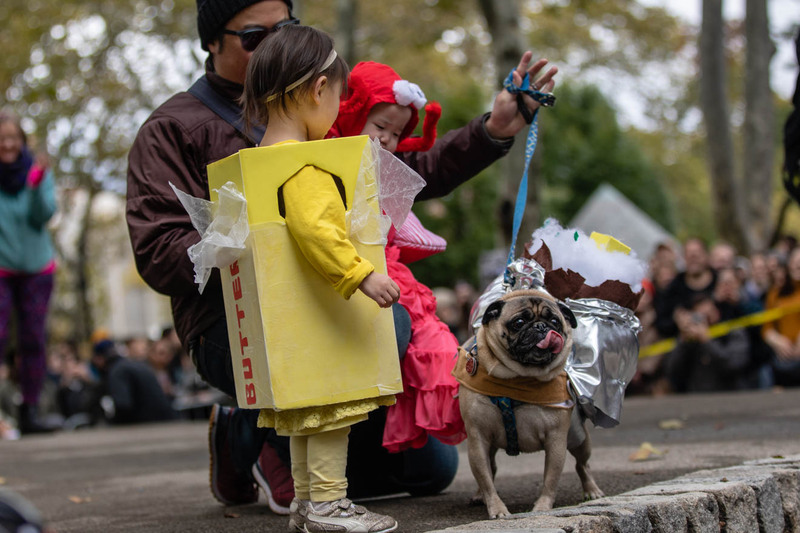 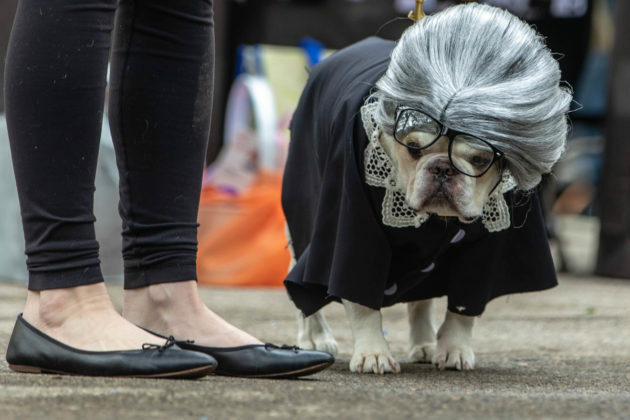 FORT GREENE – Despite being rescheduled from Saturday due to the Nor’easter, Fort Greene Park was packed on Sunday for the 20th annual Fort Greene PUPS Great PUPkin Dog Costume Contest. 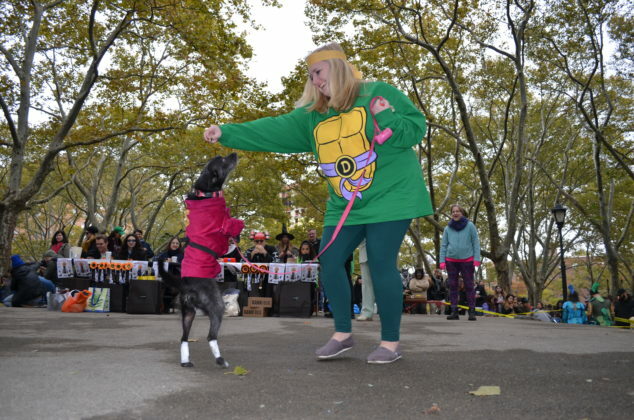 More than 100 contestants strutted across the stage for the enthusiastic, dog-loving crowd. 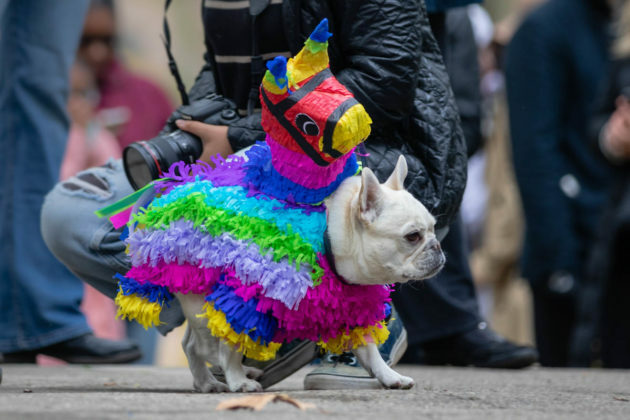 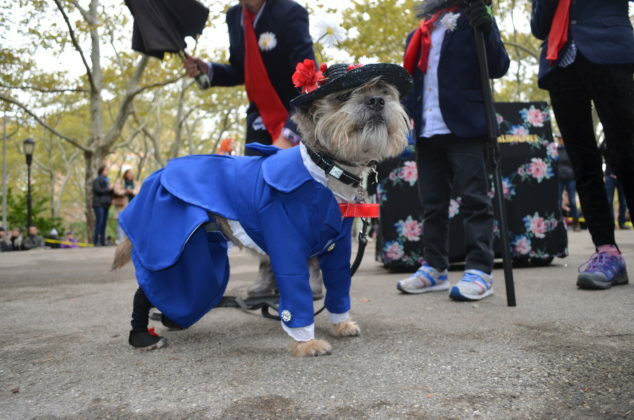 There were politically-themed costumes (Melania and Donald Trump, Ruth Bader Ginsburg, The Blue Wave), pooches dressed up as food items (Devil Dogs, lobsters, sushi, a baked potato, and the cutest Sour Patch Kid ever), and group costumes (The Wizard of Oz, Doggy Poppins, The War Horse). This year’s competition even featured its first-ever feline contestant! 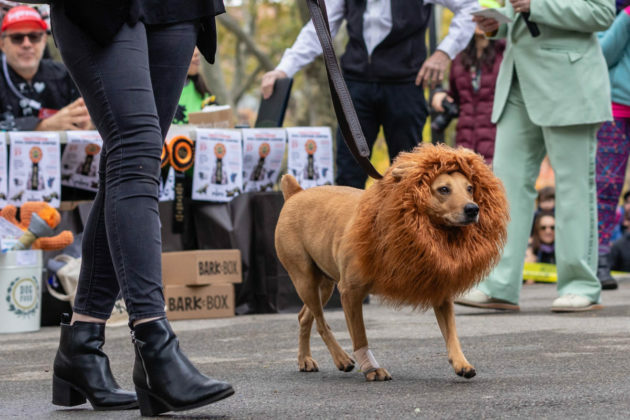 There were so many creative costumes that the judges awarded seven entrants Honorable Mention—presenting them swag bags filled with merchandise generously donated by local businesses. 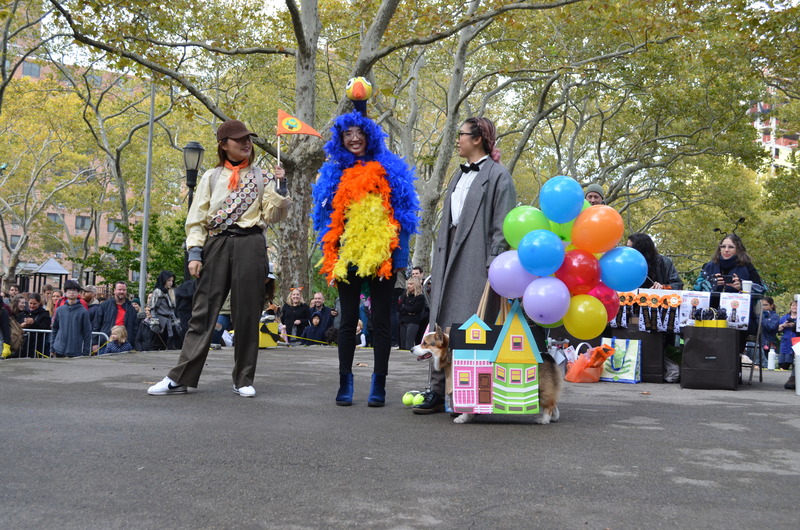 Third place went to a Corgi cutie dressed as the balloon-adorned house in Up while second place went to Doggie Poppins and three chimney sweeps. 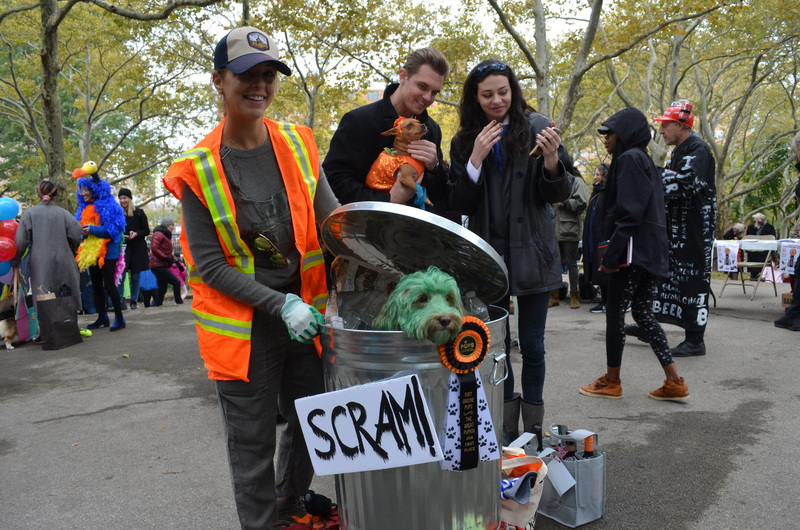 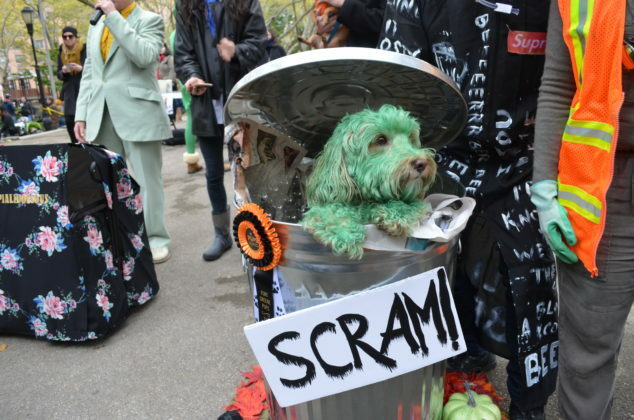 The grand prize winner, selected by audience applause, was Oscar the Grouch, an adorable and good-natured 5-year-old Labradoodle, Kody, poking his green-painted head and paws out of a silver trash can. 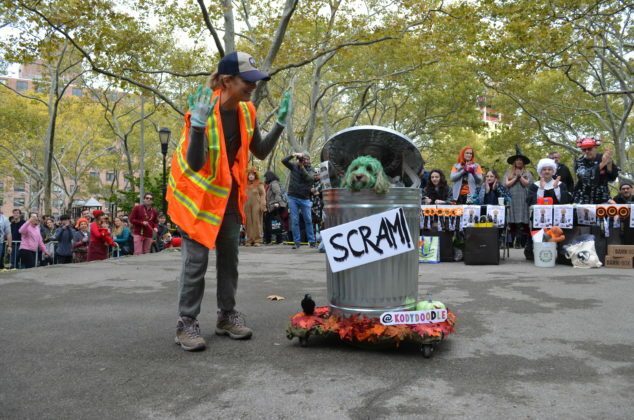 Kody’s new-found fans can follow him on Instagram at @kodydoodle. 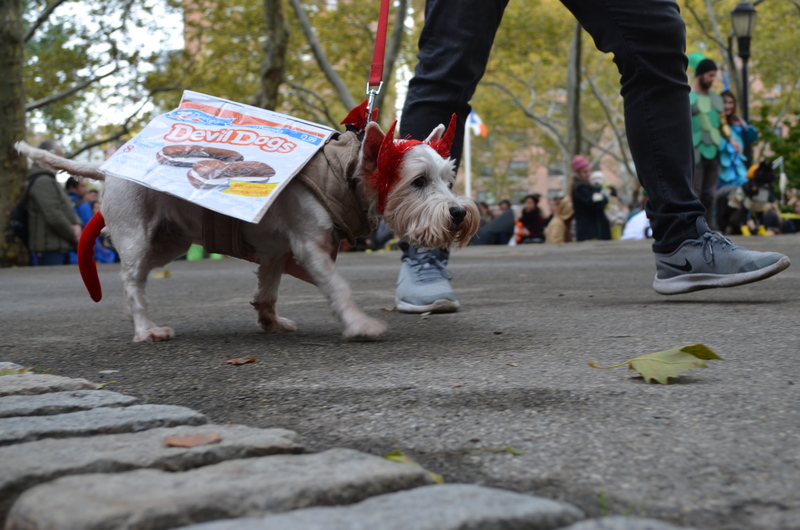 “The best thing we like to do is to bring a smile to people’s faces and I think we brought a lot of smiling today,” Pezzillo-Foldes added. 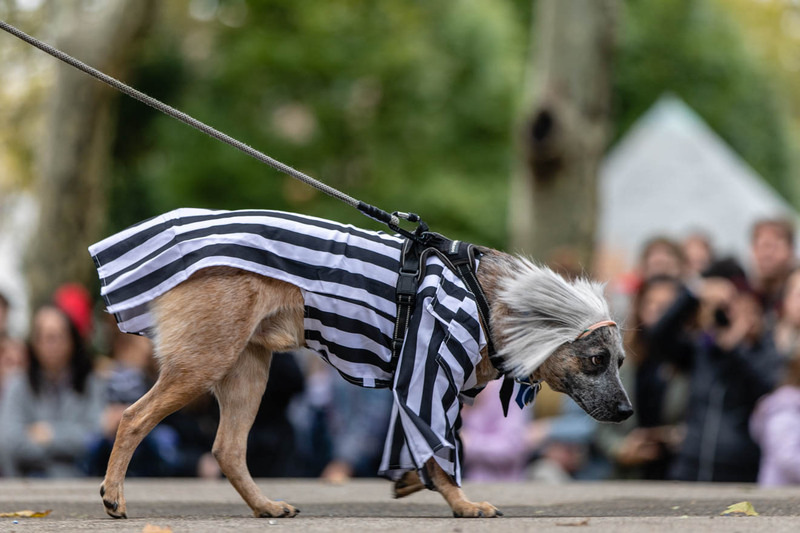 In years past, Hansen said she was always busy during the event, “organizing people, moving things around, and trying to coordinate things, so I [didn’t] really get to see the costumes so much.” So for her final year helming the competition, she decided to enjoy the show and the furry, four-legged contestants. 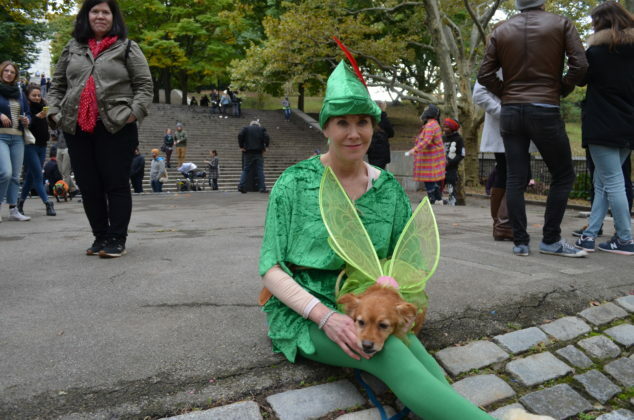 “This year I really paid attention because this is my last one. 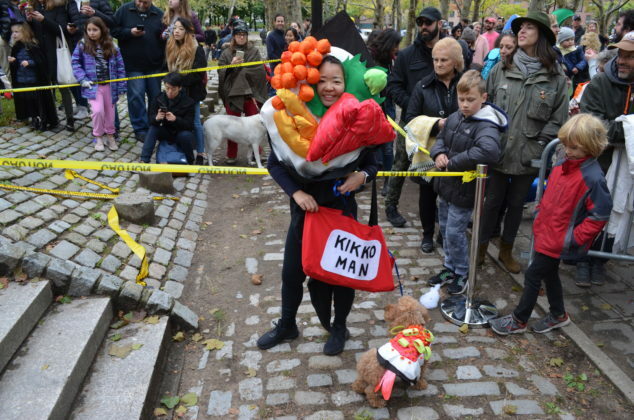 I enjoyed it more this year,” she said, noting the wrestling-themed Luchadorable Lucy contestant as one of her favorites. 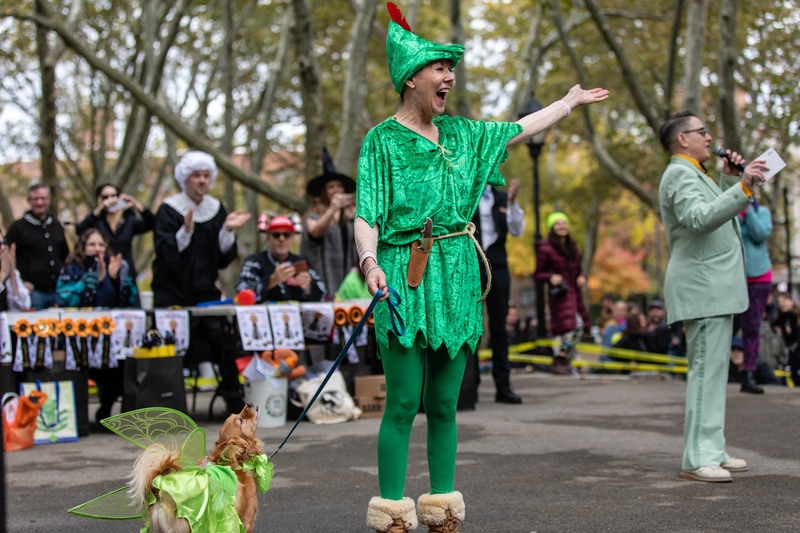 While Hansen promises she will return next year with her dog Stanley (the pair were dressed as Peter Pan and Tinker Bell on Sunday), she will do so as a contestant instead of the event organizer. 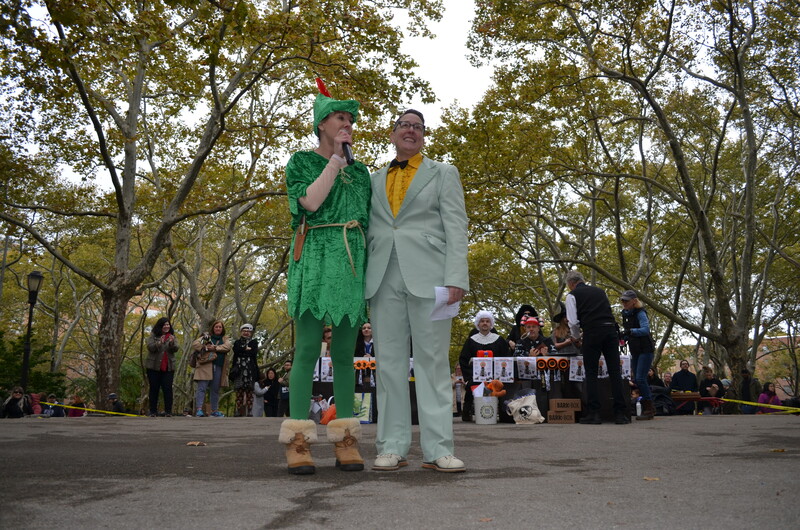 The Great PUPkin’s longtime MC, Justine Keefe, hopes she’ll be invited back to host next year by whomever takes over. 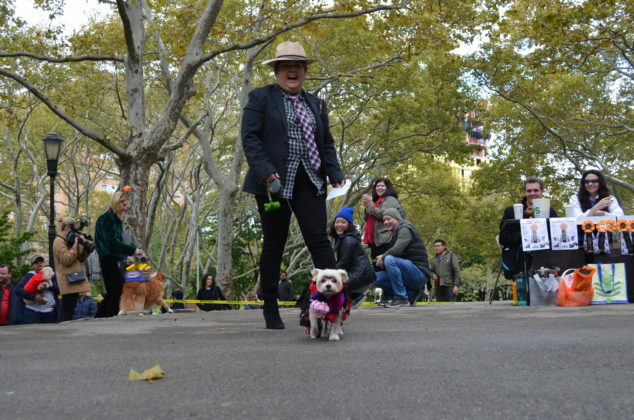 “I have so much fun doing it,” she told BKLYNER after the event. Keefe has a knack for moving the show along and for keeping the audience engaged and laughing. 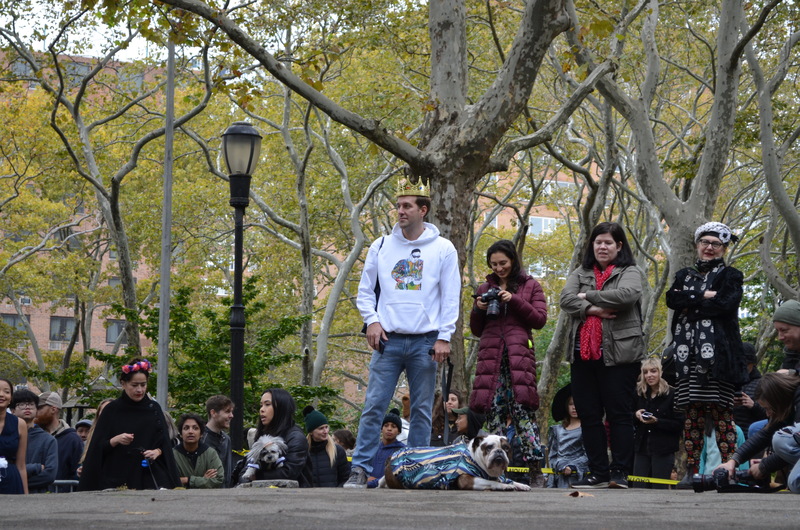 “I used to live right in the neighborhood like a block from the park so we knew each other from bringing our dogs to the park in the morning,” Keefe said of first meeting Hansen. 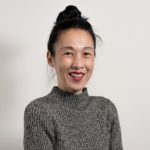 She’s been hosting the family-friendly event for about 15 years and has continued to do so even after moving to New Jersey about ten years ago.